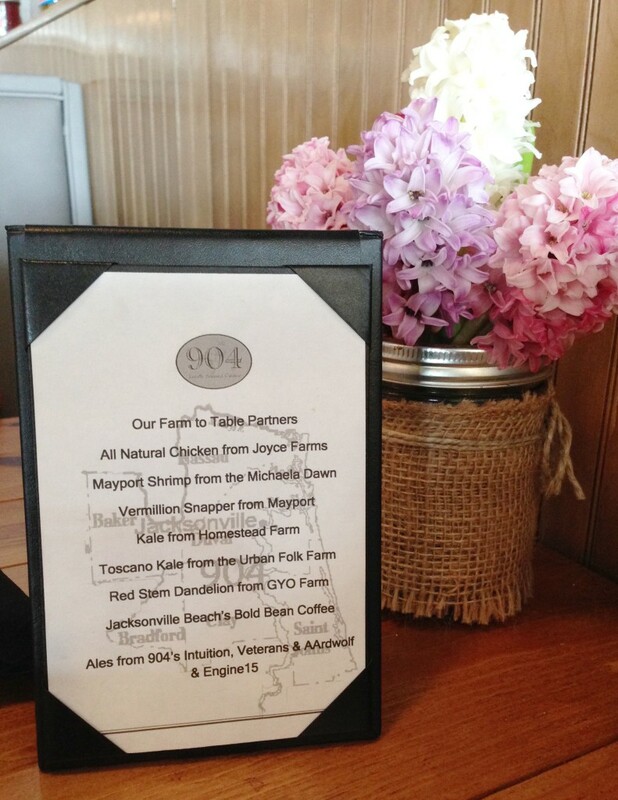 Jacksonville Restaurant Reviews: Home > Beaches > [Closed] 904 – Welcome to the Farm-to-Table Family! [Closed] 904 – Welcome to the Farm-to-Table Family! Farm-to-table dining is all the rage these days. And for good reason…the fewer the steps between the farm and your plate, the better the food. Eating locally sourced food is not only more nutritious, but the food also tastes much fresher and more flavorful. And that is what is most important to us – tasty food. The growing farm-to-table trend has meant a plethora of new locally sourced restaurants opening up in Jacksonville in recent years. 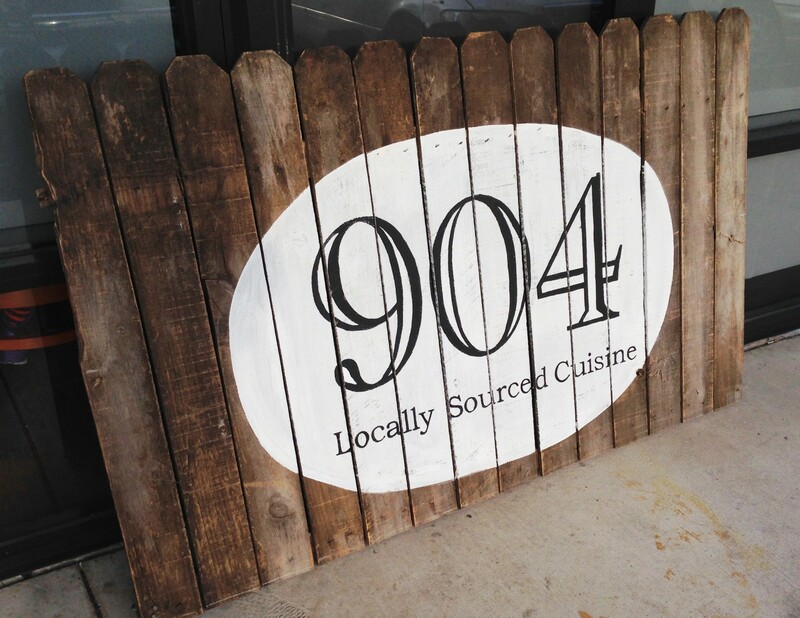 One of the newest farm-to-table dining spots in town is a little place called 904. 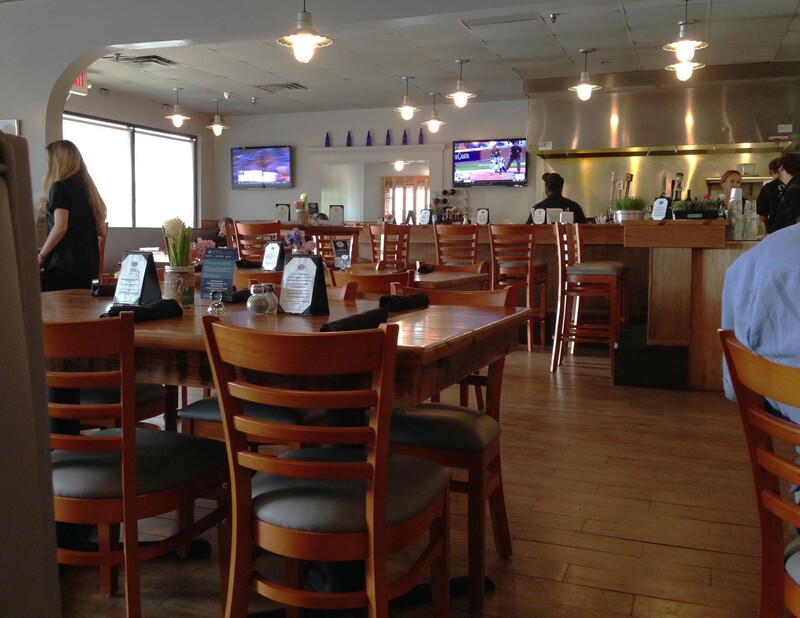 904 is tucked onto the end of a fairly nondescript shopping plaza in Jax Beach on Penman Road. Despite only having been open for a few short months, 904 already feels like a fixture in the neighborhood and the quality of food and service is top notch. Now I know it may seem that we are a little late in getting the word out about 904. And I’m not so sure they really need us to get the word out…it seems like everyone is raving about the place already. In actuality, members of our JRR family have dined at 904 a few times before we actually got around to putting pen to paper (fingers to keyboard?). On our first couple of visits, we were just too busy drooling over all the delicious food to take notes and put together a review. Plus, we wanted to be sure to take our time and try out a wide variety of dishes in order to really be able to do this place justice in our review. First off, we love the “feel” of 904. The location itself (on the end of a strip mall) was a bit unexpected, but walking in, we immediately felt right at home. The bar area is open and spacious and has a direct view into the kitchen. 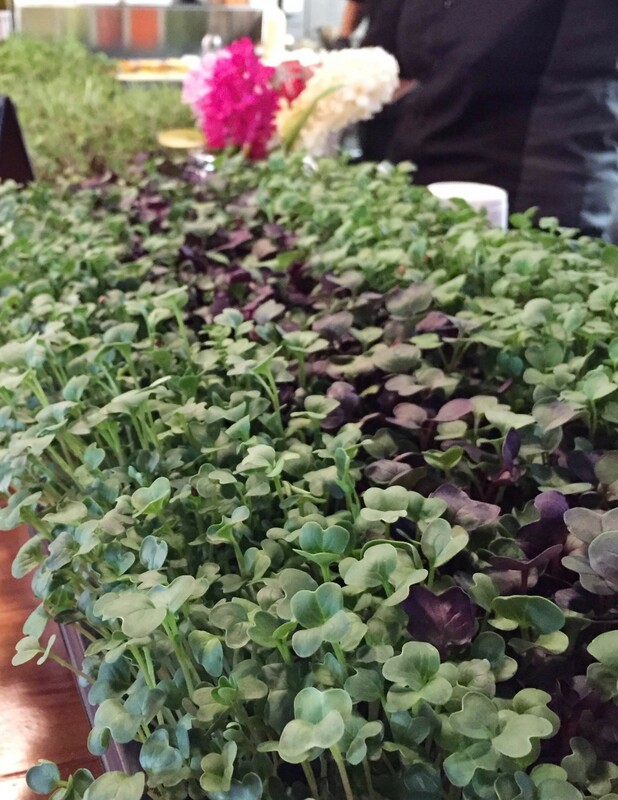 Trays of locally grown microgreens grace the bar, ready to be plucked out and placed atop a beautifully plated meal. The decor at 904 is simple, modern, and comfortable. Wood floors and custom-made reclaimed wood tables make the place feel rustic and reinforces the owners’ goal of staying local and supporting merchants right in our area. The jars of homemade jams, pickles, and relishes on display for sale really tugged at my southern heartstrings and added a country, homey feel. As a southern girl, I grew up on homemade pickles, jars of home-grown fruit jams, and flavorful relishes with ingredients straight out of the garden. Seeing those jars on display was like walking into my grandma’s kitchen. I was ready for some good home-cooked food! The menu at 904 focuses heavily on seasonal, local ingredients. So expect it to change every now and then based on what’s available and what’s in season. There is a good selection of local seafood, produce, and baked goods, with a list of their vendors right there on each table. There are vegetarian options that sounded incredibly appetizing, despite my carnivorous tendencies. There are also a lot of familiar comfort food options, but each with some sort of adventurous twist thrown in. 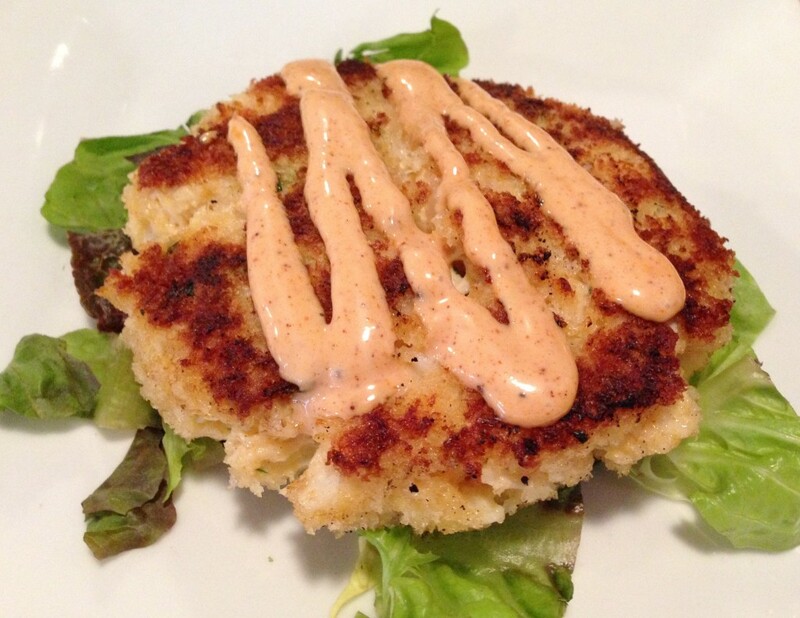 On this latest visit, we started with something familiar…a crab cake. The Shrimp and Crab Cake ($10) at 904 is amazing. The juicy bits of Mayport shrimp are a nice addition and the ratio of crab to breading is just perfect. Add to that a perfectly crispy outer crust and a great citrusy datil pepper aioli and this was easily one of the best crab cakes I’ve eaten. Plus it was huge, so it was ideal for sharing, even though I really wanted it all for myself. For our entrees, we had the Shrimp and Grits ($16) and a Pan Seared Flounder special ($24), plus a side order of Turnip Croquettes ($5). 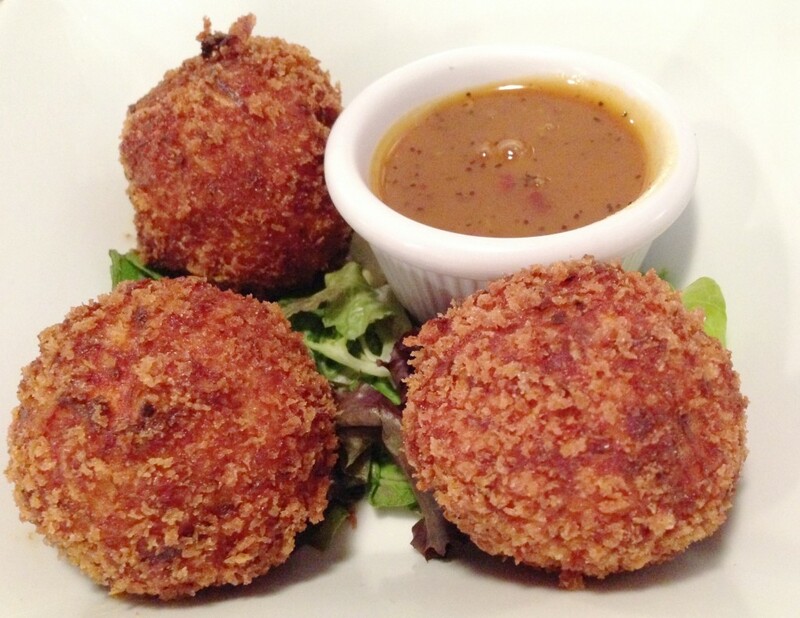 Lets start with the croquettes. I’m typically not a fan of turnips. I’ve never cooked a turnip in my life and it’s just not a food that I get excited about eating. But for some reason, I was drawn to the description of these turnip croquettes…parmesan cheese, fresh herbs & seasonings, panko…fried. And oh yeah, turnips. I’m so glad we gave these a try because they were so, so good. Finely shredded turnip, mixed with cheese, seasoned well, and fried to golden perfection. The Peruvian datil pepper dipping sauce was a great compliment. We loved this side and it was a good size portion for the price. We were too full to finish all of it and I was honestly pretty sad about that. The Pan Seared Flounder special was another winner. The locally-caught flounder was really fresh, was cooked perfectly, and had great flavor. 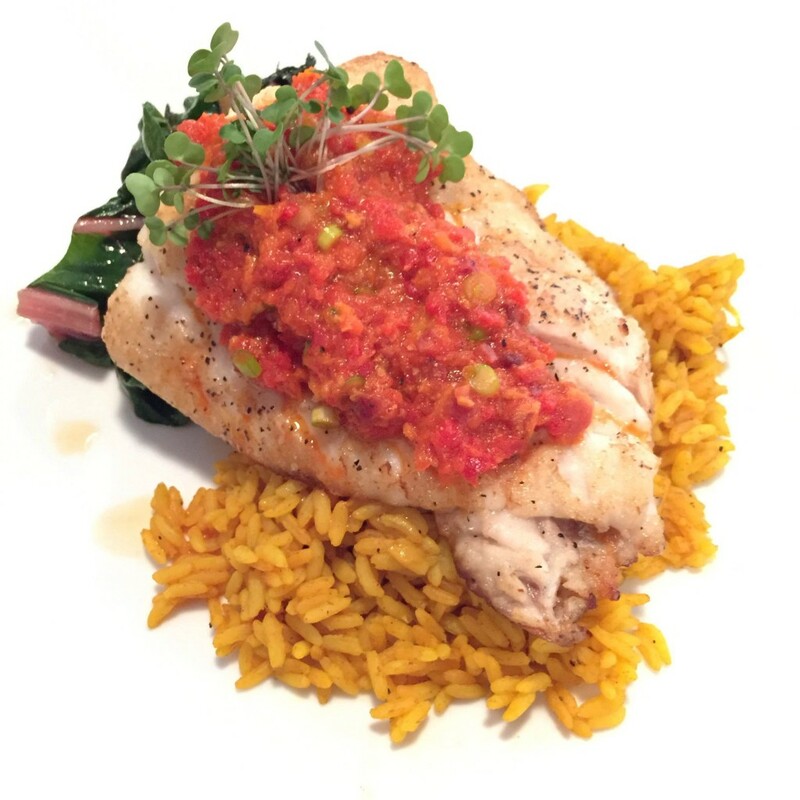 It was served with yellow rice and tasty well-seasoned sautéed rainbow chard. Everything was cooked well and tasted great. But the best part was the melt-in-your-mouth red pepper and bacon relish served on top of the flounder. This relish was amazing. It was full of fresh, rich flavor and complemented the fish perfectly. I really wanted to take a jar of that relish home with me! The dish that impressed us the most was the Shrimp and Grits. I have eaten my fair share of grits in my lifetime. 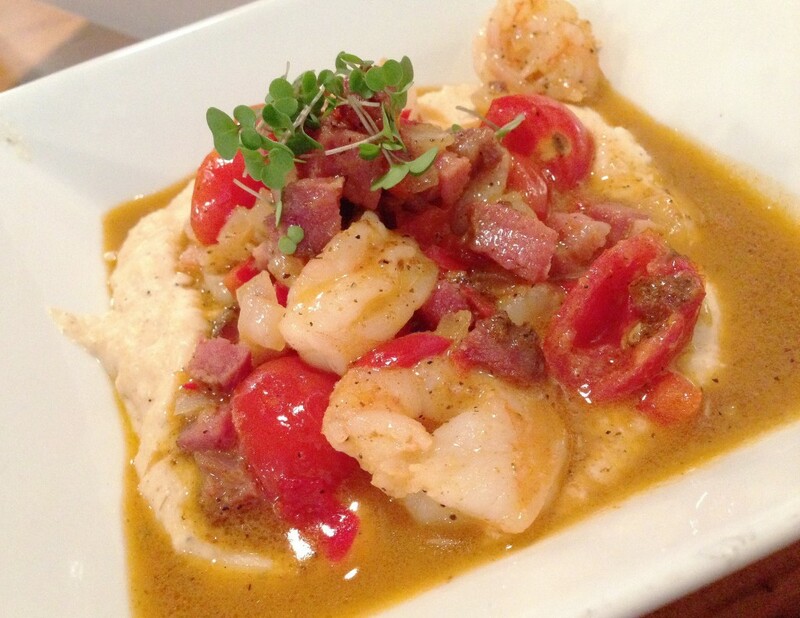 I love grits and I really, really love a good bowl of shrimp and grits. For me, it is pretty much the quintessential comfort food. So when I saw Shrimp and Grits on the menu, I knew I had to try it. And it far exceeded my expectations. The Mayport shrimp were amazingly plump, juicy, and perfectly cooked. And the Tasso ham and beer broth was bursting with flavor. The thing that really blew us away was the grits. Like I said, I’ve eaten grits my whole life and I thought I knew what to expect when I ordered grits. I can honestly say that I have never had grits like the ones I had at 904. The texture of grits is normally well, gritty. But not these. These grits were incredibly smooth and creamy. They were light and had an almost whipped texture. It completely threw me off…in a very good way. I think we scared our server a bit when we called her over to grill her about how the grits were prepared. But I assure you that we were pleasantly surprised by this unique twist on such a familiar dish. We finished up our meal with another familiar classic, Bread Pudding ($6). This dessert, along with all their others at 904, is homemade by the chef’s mom. And that homemade touch definitely came through. The bread pudding was delicious and comforting. It was filled with chocolate and cranberries and topped with a scoop of ice cream. We were given a couple different ice cream flavor options, and they all sounded great. But we ultimately chose coffee ice cream and it complimented the bread pudding perfectly. What a great end to an amazing meal. We usually don’t say much about service (unless it’s really bad), but we just have to say that the servers at 904 are some of the best we’ve met in a while. Our server (along with all the other staff that we interacted with) was friendly and laid-back, yet still attentive and very knowledgeable. As we were leaving we stopped by the bar area to check out the trays of microgreens that I mentioned earlier. I wanted to snap a quick photo and try to not get in the way of the hustle and bustle by the kitchen. The server standing nearby saw us and took the time to explain exactly what it was we were looking at. Instead of feeling like we were in the way, we felt welcomed and invited in. And we learned a little more about the food being served. The staff at 904 clearly has a passion for what they are doing and it really shows. Our experience at 904 was great. Everything from the decor to the menu to the food has been well thought-out and executed to focus on local ingredients and supporting farms, breweries, and merchants right in our own backyard. The best thing about 904 (other than the great food) is that it’s farm-to-table without being fussy, intimidating, or complicated. The food is simple and comforting but still delicious and slightly unexpected. And it is really amazing food without being pretentious. We felt like family and 904 felt like home. Tagged Alcohol Serving, american, Brunch, farm-to-table, free wi-fi, Gluten-Free Friendly, kid friendly, romantic, vegan friendly. Bookmark the permalink. We have eaten ate 904 several times. Chef Matt is great & so is the food. My only disappointment was the hamburger. I asked if they would do medium rare & was assured I could have it cooked to any temperature I desired, however the end product was well done & dry. I do not use any condiments on my burgers as I like the flavor of the meat to be the star but I had to use a lot of ketchup on this burger just to keep it from sticking in my throat. I have not ordered this again & will give it one more try but if it fails again, I think I would suggest removing it from the menu.